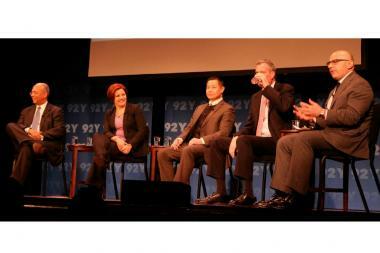 Democrat mayoral candidates debate the issues at a mayoral forum at the 92Y, 1395 Lexington Ave., on March 21, 2013. 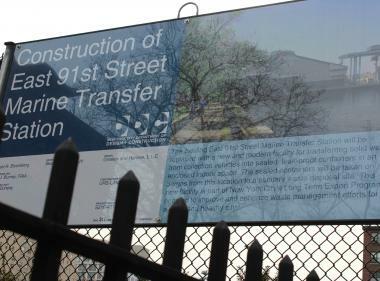 UPPER EAST SIDE — An influential neighborhood Democratic group has opted against endorsing a candidate for mayor — snubbing all Dem front-runners based on their support for the controversial East 91st Street Marine Transfer Station, a club official told DNAinfo New York. The East Side Democratic Club, which serves Yorkville and parts of the Upper East Side, decided to withhold its support Sunday night, said Betsy Feist, the group's president. The decision not to endorse means the club will not petition to get any Democratic mayoral hopeful on the ballot. "More people on the Upper East Side and Yorkville are concerned about this issue than any other, and it is an extremely important issue," Feist said Monday. This construction sign reads: "The existing East 91st Marine Transfer Station will be replaced with a new and modern facility for transferring solid waste from collection vehicles into sealed leak proof containers in an enclosed indoor space. The sealed containers will be taken on barges from this location to a sanitary waste disposal site. This new facility is part of the New York City Long Term Export Program orientated to improve and enhance waste management efforts for a clean and healthy City." "We will not support a candidate unless that candidate is ready to say they will not go ahead with that project." The move comes shortly after another powerful organization, the Lenox Hill Democratic Club, shifted course and decided against endorsing City Council Speaker Christine Quinn for mayor because of her advocacy for the polarizing public works project. The Lenox Hill Dems — whose members do not live in areas most likely to be impacted by the trash site — also decided against endorsing any other top mayoral contender based largely on the candidates' support for the East 91st Street Marine Transfer Station. "What happens on the East Side of the street still affects other people in the neighborhood," club President David Menegon told DNAinfo New York. Those who protest the East 91st Street transfer station have long maintained that it will destroy the quality of life on residential streets of the East 70s, 80s and 90s by drawing vermin and causing noise as well as other health and traffic issues. East Side members also voted Sunday to team up with Pledge 2 Protect, a coalition of community groups that recently launched a campaign against the East 91st Street project — and has vowed to keep any pro-MTS politician out of office. Though Democratic mayoral contender Sal Albanese recently came out against the station, the East Side club decided not to endorse him because its members preferred other candidates, Feist said. Albanese, a former City Council member, was not deterred by this news. "Sal stands against the transfer station because it would hurt the neighborhood, hurt public housing residents, and hurt kids from around the city who play at Asphalt Green," an Albanese spokesman told DNAinfo New York. "That people-first approach to governing is going to resonate with New Yorkers in the UES and around the city, regardless of what political clubs do." Other Democrat mayoral candidates snubbed by the club — including Quinn, Comptroller John Liu, former comptroller and runner-up in the last mayoral election Bill Thompson and Public Advocate Bill de Blasio — could not immediately be reached for comment Monday night.